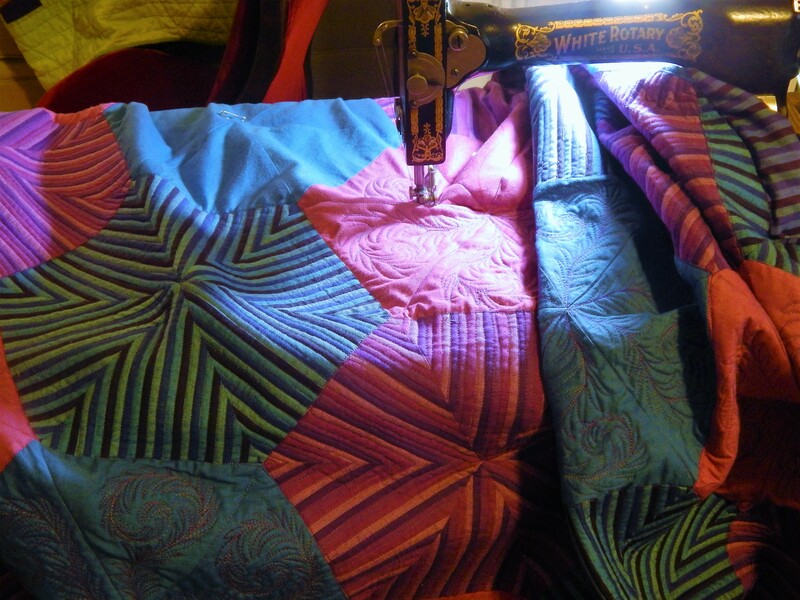 I finished hand quilting it today. 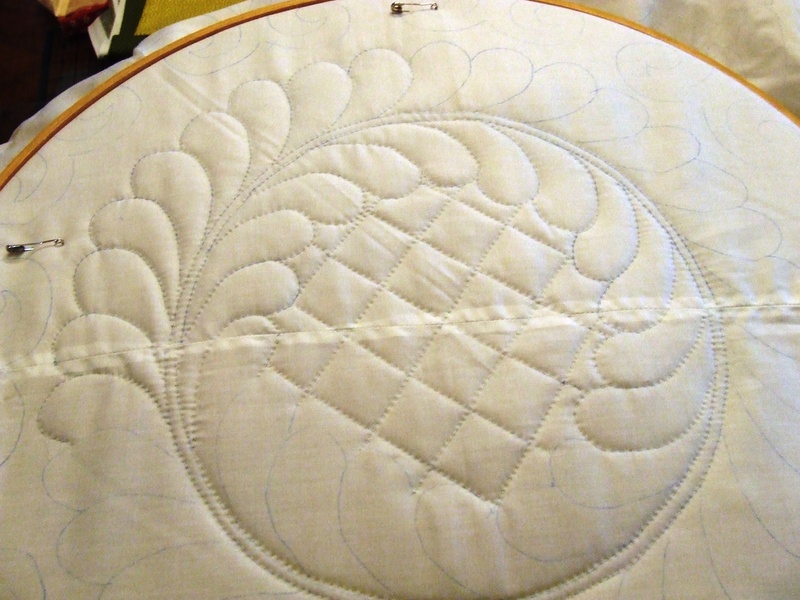 I used Aurifil 12 wt thread and a big stitch Quilting needle (Colonial Needle Co.) for the quilting. The Batting is Mountain Mist Creme Rose, and the backing is unbleached Muslin. Teddy gave it a test inside on his chair. This entry was posted in Flowers, Garden, Quilts and tagged flower Garden. liberated baskets, hand quilting, Quilting, Quilts. I just love the basket quilt. The colors are so soothing. That was my thought when I first saw it, too! I love your basket quilt. The colors are great. How did you like the Mountain Mist batting? Love the colors, Teddy seems to think so, too! If it passes the Teddy test, you know it’s good! And of course the flowers are amazing! Such a great quilt, and the quilting is swoon-worthy! 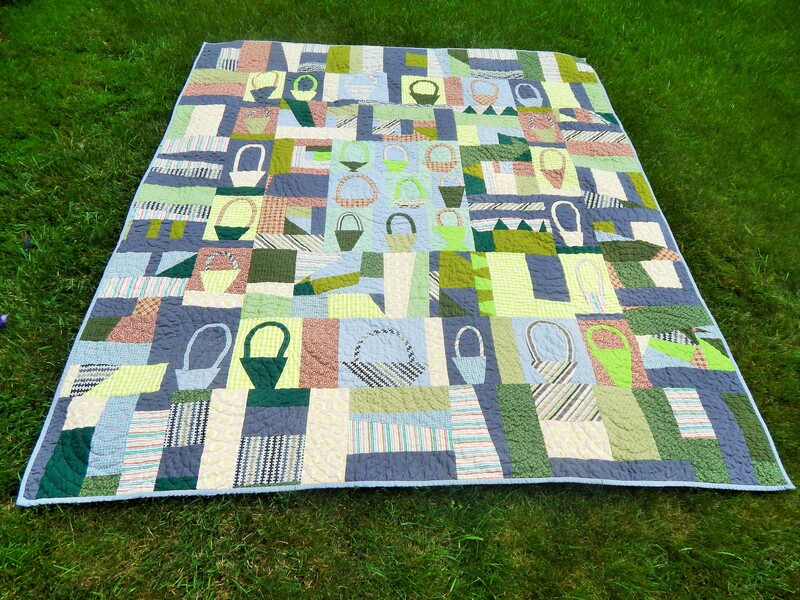 The perfect quilt for a picnic on the grass – with a basket, of course! Lovely. Love the the colors in your liberated baskets quilt. I especially like the wonky blocks around the baskets. I enjoy seeing your quilts and the garden pics. Your quilt really suits the garden! Summer time, bees buzzing, clink of cold drinks and cool Teddy. Delightful basket quilt! Like the unbleached muslin choice for a back, too. Must get some for my next quilt. 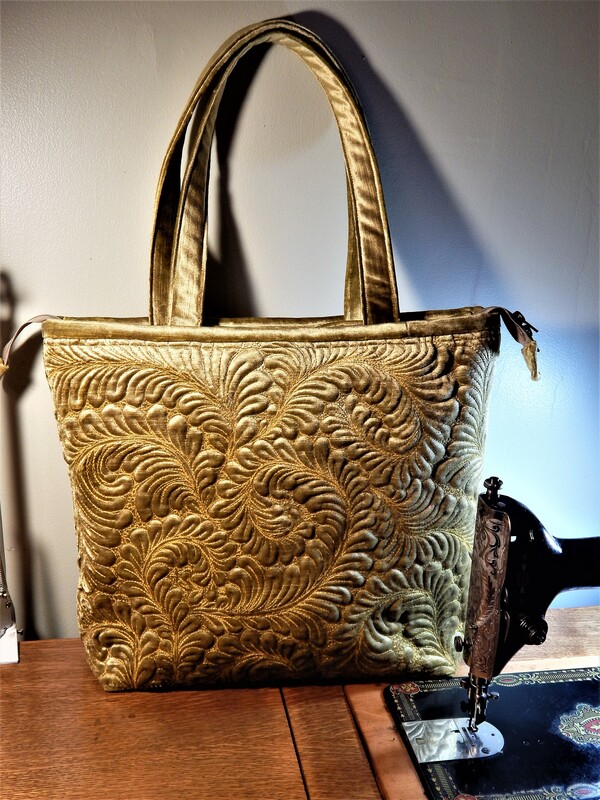 Thanks….liberated stitching for liberated baskets…. Great looking quilt!! That quilt and Teddy look like they were made for each other ! 🙂 Thanks for sharing more lovely flowers. I just love this quilt! It looks like Spring!! 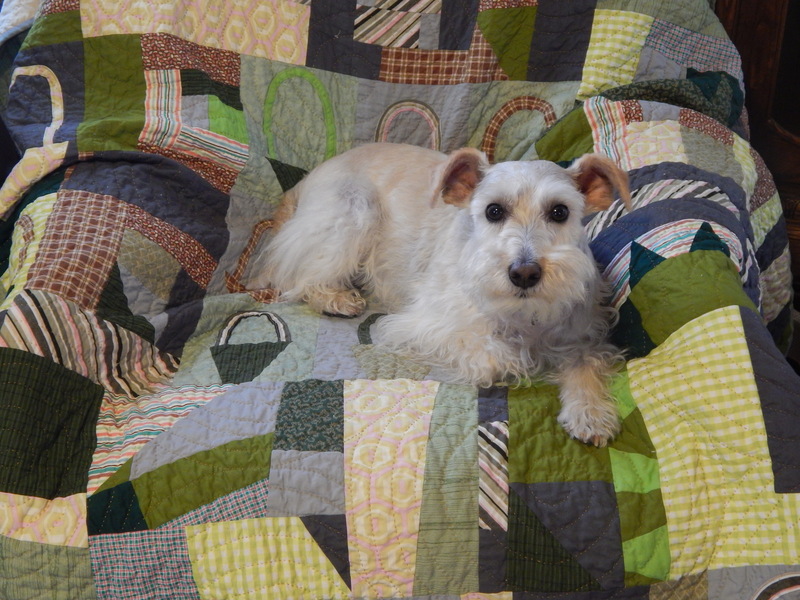 Teddy has good taste in quilts. Always love the photos of the garden. 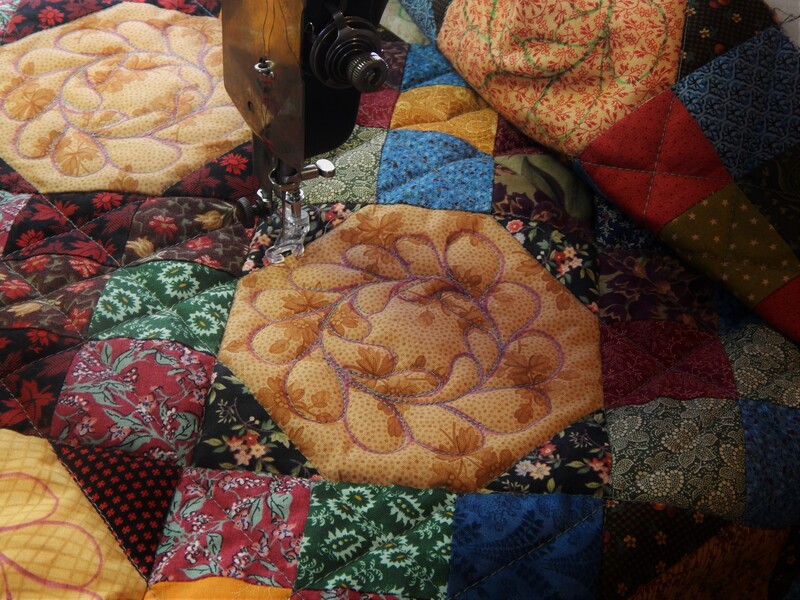 awesome quilt – and lovely flowers! As usual your quilts are beautiful. The colors are so peaceful to look at. I think it says summer. Teddy is his handsome self. He is so cute. Thanks for sharing your May basket quilt..wonderful as always!! I love this quilt, makes me smile whenever i see it. Love the quilting too.